In July Turkey experienced a failed military coup against the elected government of President Recep Tayyip Erdoğan, leader of the conservative Justice and Development Party (in Turkish, Adalet ve Kalkınma Partisi or AKP). The Turkish government blames the coup on Fethullah Gülen, a Turkish preacher living in exile in the United States whom the government regards as a terrorist. It is demanding his extradition, but the United States has to this point refused to comply without hard evidence connecting Gülen to the coup. In the meantime, the Turkish government has declared a state of emergency and begun suspending, imprisoning, or firing tens of thousands of political opponents, including 9,000 police officers, 21,000 private school teachers, 10,000 soldiers, nearly 3,000 judges, 1,500 university deans, and more than 100 media outlets have been forcibly shuttered. This political purge is an escalation of a pattern of behavior that existed before the coup. For a long time Erdoğan and the AKP have concentrated power, acting against the press and against Turkey’s civil society and eroding Turkey’s secular norms. Those who support Erdoğan tell a story in which an embattled democratically elected president is beset by a would-be junta, but the situation in Turkey is considerably more complicated than that, and there is a strong case that Turkey’s constitution is not up to the task of protecting Turkey’s political system from increasingly unlimited abuse. Before the coup, the situation in Turkey was already deteriorating. On Reporters Without Borders’ World Press Freedom Index, Turkey ranks 151st out of 180 countries, with a score of 50.76 (low scores are better). This is a worse score than Putin’s Russia, which ranks 148th. As recently as 2008, Turkey ranked 102nd with a score of 22.75, which is less than half as bad (Russia was 141st that year). The United States scored a 22.49 this year. So in the span of eight years Turkey’s press environment went from about as good as America’s is today to worse than Russia’s. If Turkey had recorded a 50.76 in 2008, its score would have been worse than Egypt under Mubarak. When people cannot say what they think in a country without fear of reprisal from the state, the state is able to control the flow of information and effectively indoctrinate the populace. When the voting population is indoctrinated the outcome of elections is inevitable and there cannot be free competition among different political parties. There are many Turks who are furious with the United States for refusing to hand over Gülen and furious with writers in the west who have entertained, as I am now entertaining, the possibility that regime change in Turkey might be necessary. These people have been indoctrinated by a Turkish press that is increasingly intimidated by the government and is both censored and self-censoring. The reality is that Turkey is now an illiberal state. Its constitution has failed to protect free speech and freedom of the press. When a country’s constitution is no longer effective, sooner or later the inevitable result is a legitimacy crisis. Because the constitution is no longer functioning properly, it is impossible to fix the constitution through legal means. If the constitution could be fixed within its own rules, it would not need fixing in the first place. Free competition among different political factions fosters dynamism and vitality–without it, governments inevitably become static and incapable of evolving and adapting in the face of change and crisis. Eventually a crisis comes along that the government cannot manage, and since the government cannot be replaced through legal means it will be deposed through some kind of extralegal mechanism–usually violence or direct action. When the armed forces lead it we call it a coup, when it is led by a segment of the public we call it a revolution. But in both cases, the aim is the same–to make a large political change that is deemed necessary but impossible because of failures in the constitution. This is not exclusively a problem for illberal regimes–there are many ways that liberal constitutions can fail to function too, though they usually fail differently. Turkey has had several post-war constitutions, but on a number of occasions the military has decided that the constitution has failed and staged coups to rewrite it. Whether we agree with these coups should depend on whether we think the constitution really did fail and whether we think the new regime that emerged after the coup is an improvement. What we must not do is oversimplify and assume that coups are either always good or always bad. The current Turkish government itself is grounded on a constitution that was ratified in 1982 by a referendum that took place under a military junta which itself had seized power through a coup in 1980. In the 1980 coup, hundreds of thousands were arrested and the old constitution of 1961 was thrown out. So those defending Erdoğan cannot claim to do so on the principle that coups are wrong–they are implicitly approving of the 1980 coup and the constitution it produced. The 1961 constitution was itself the result of the 1960 coup. Constitutions are not handed down by God and they do not appear untainted from the ether. It is one of the cruel paradoxes of democracy that democratic constitutions cannot be self-imposing–they are written and imposed by those with power through extralegal means. In the United States we like to imagine we are different because our constitution was created through a constitutional convention and voted on by the states, but who decides that the constitution will be created through a convention? Who decides what the rules of the convention will be? Who decides how the delegates will be selected? Who decides that the individual state governments are the appropriate units for representation at the convention? Who decides that it’s acceptable to violate British law and stage a revolution in the first place, and what determines whether or not that revolution succeeds? All democracies are created through nondemocratic means by those who had power before the constitution was written. We can only assess constitutions by the quality of the outcomes they produce for citizens. Maybe today most Turks are still satisfied enough with Erdoğan’s government that they don’t consider the constitution a failure. Maybe they think living in an illberal state is no big deal, because they like Erdoğan’s emphasis on the role of Islam in government or they think Erdoğan is good for economic development. But let’s not pretend that Erdoğan deserves special consideration because of some connection he has to a democratic constitution. 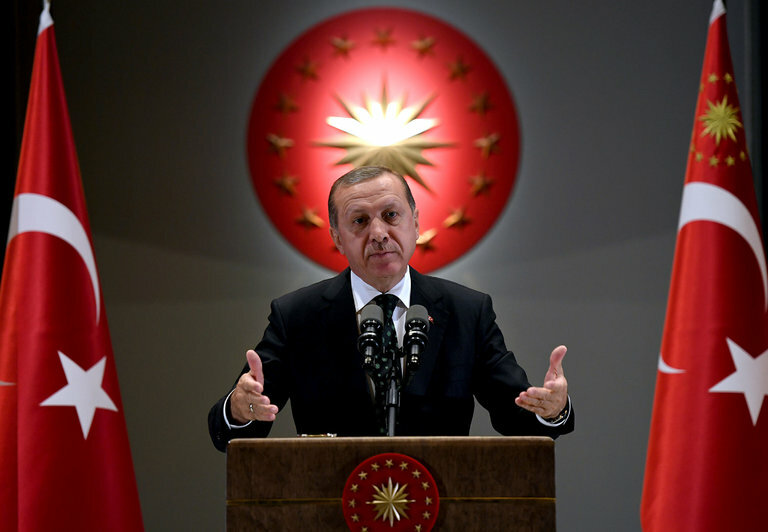 As with all regimes, democratic or undemocratic, Erdoğan’s will be judged by its results. If some people in Turkey decide that Erdoğan cannot do what needs to be done and that the constitution will not allow for his removal, they will try to depose him through extralegal means, and Erdoğan will respond with more repression to protect himself from his critics. The more he does that, the more Turkey will lose the ability to adapt and change, and the more devastating the legitimacy crisis will be when it comes.